Give Up Attachment To Worldly Concerns. .. Sometimes we get so caught up in the names of religions that we forget their meaning, and busy ourselves defending our religions and criticising those of others. This is useless venture. In fact the term, Dharma includes any teaching that, if practiced correctly leads people to temporal or ultimate happiness. It doesn't exclude teachings given by other religious leaders, provided that these teachings leads us to the attainment of temporal or ultimate happiness. Examples are readily available: moral disciplines such as abandoning killing, stealing, lying, sexual misconduct and intoxicants is taught in many other religions, as is love and compassion for others. This is the Dharma, and it is beneficial for us to practice such advice, whether we call ourselves Buddhist or Hindu or Christian or whatever. This is not to say that all religions are the same in every aspect, for they aren't. However, everyone, no matter what religion we identify with, should practice the parts in each of them that leads us to temporal or ultimate happiness. It is extremely important not to get bogged down in words. Sometimes people as me, "Are you Buddhist, Jewish, Christian, Hindu or Muslim? 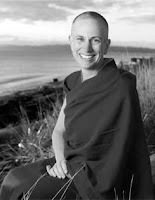 Are you Mahayana or Theravada? Do you follow Tibetan Buddhist or Chinese Buddhism? Are you Gelu, Kargyu, Sakya or Nyingma?" To this complexity of concepts, I reply: "I am a human being searching for a path to discover truth and happiness and to make my life beneficial for others." That's the beginning and end of it. The true criterion of whether we are a religious or spiritual person is whether we have a kind heart towards others and a wise approach to life. These qualities are internal and cannot be seen with our eyes. They are gained by honestly looking at our own thoughts, words and actions, discriminating which ones to encourage and which ones to abandon, and then engaging in the practice to develop compassion and wisdom in order to transform ourselves. Real Dharma is not huge temples, pompous ceremonies, elaborate dress and intricate rituals. We can't judge another person's motivation, nor should we waste our time trying to evaluate others' actions. We can only look at our own mind, thereby determining whether our actions, words and thoughts are beneficial or not. For that reason we must eb ever attentive not to let our minds come under the influence of selfishness, attachment, anger, etc. As it says in Eight Verses of Thought Transformation: "Vigilant, the moment a disturbing attitude appears, endangering myself and others, I will confront and avert it without delay." In this way, our Dharma practice becomes pure and is effective not only in leading us to temporal and ultimate happiness, but also in enabling us to make our lives beneficial to others. ........ .... .... But Our Internal Motivation.